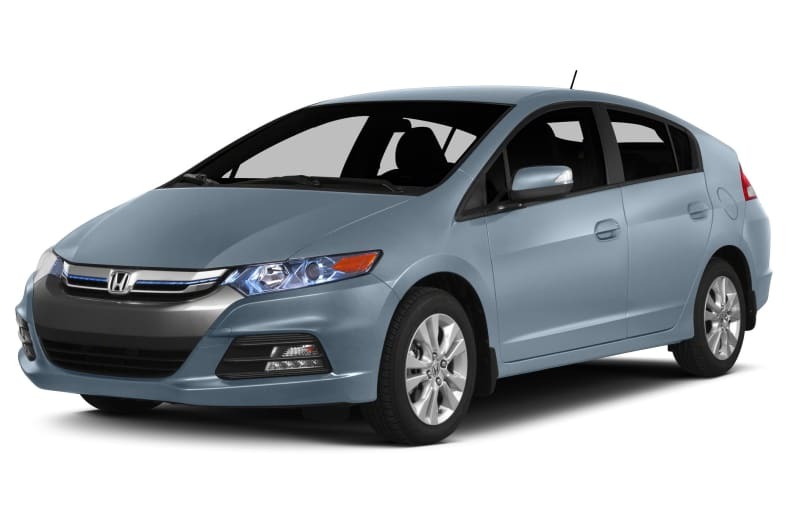 The Honda Insight is an aerodynamically styled, practical four-door, five-passenger hatchback hybrid that holds the title of being the first mass-produced hybrid vehicle to market in North America. The Insight is powered by Honda's Integrated Motor Assist system, which is a combination of a 1.3-liter gas engine and a 13-hp electric motor, all attached to a continuously variable transmission. The engine and motor combined generate 98-hp and 123-lb.ft of torque, and provide 40-plus mpg fuel economy. The base trim offers six airbags, anti-lock brakes, electronic stability and traction control, automatic climate control, power windows, locks and mirrors, keyless entry and a two-speaker CD audio system with an auxiliary input. The LX trim adds floor mats, cruise control with steering wheel controls, a security system and a four-speaker CD audio system with USB interface. The EX trim adds alloy wheels, a six-speaker audio system, Bluetooth for hands-free cell phone use, heated exterior mirrors with integrated turn signals and steering wheel mounted paddle shifters. A voice activated navigation system with FM traffic and a rearview camera is available on the EX trim. The Insight is unchanged for 2014.